As my husband and I are going through our second full watch of Star Trek as a couple, I thought it would be fun to report on the highlights along the way. So I decided to copy the same format as Charlene. See her favorite episodes of Voyager season six. This episode is a little silly, but it’s fun to see the Voyager crew in a new environment. The main plot follows Janeway’s romance with a holodeck character whose program she alters to better fit her needs (and to delete his wife! 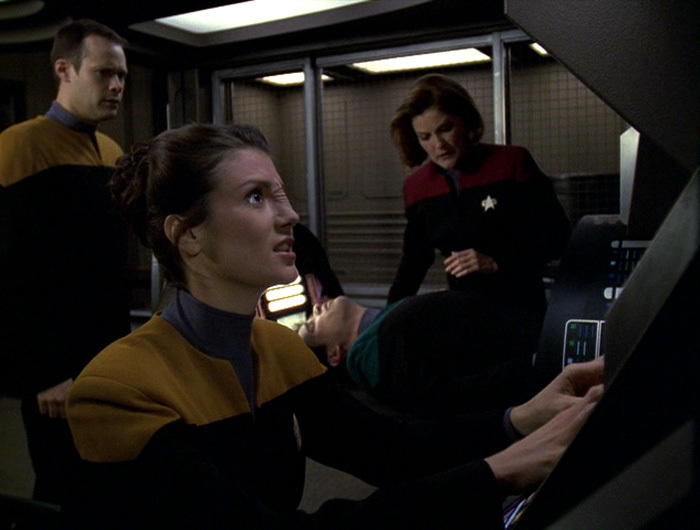 ), which is slightly alarming for Janeway, but not outside of the realm of plausibility for her either. After Seven identifies the ship’s resident misfits, Janeway takes them in for an away mission, to prove to them that they add value to the crew. What is supposed to be a simple away mission turns into a potentially life-threatening situation, and they all have to rely on each other more than ever anticipated. I really kind of liked the hypochondriac character on this episode; I would have liked to have seen more of him! Episodes that take place entirely on the ship hardly ever catch my interest, but I love the way this episode is framed. 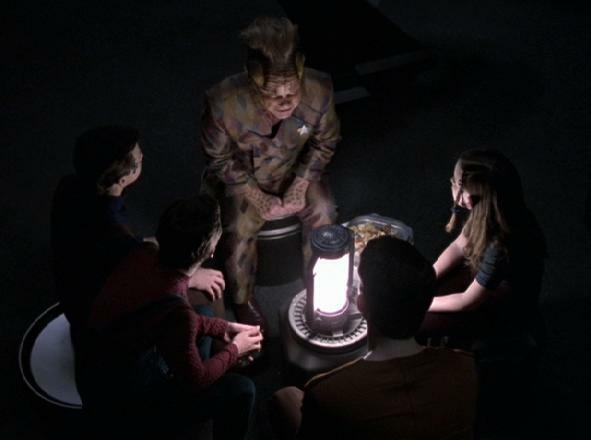 Neelix proves to be quite the storyteller as he deflects the Borg kids’ questions about what is happening on Voyager by telling them a scary story, which may in fact be the truth of what is happening. The concept behind this one is so fascinating: Voyager is trapped in a planet’s atmosphere for what feels like days for them, but for the people below, it’s centuries. If Voyager doesn’t act quickly enough, the people on the planet will soon have technology that outpaces their own. 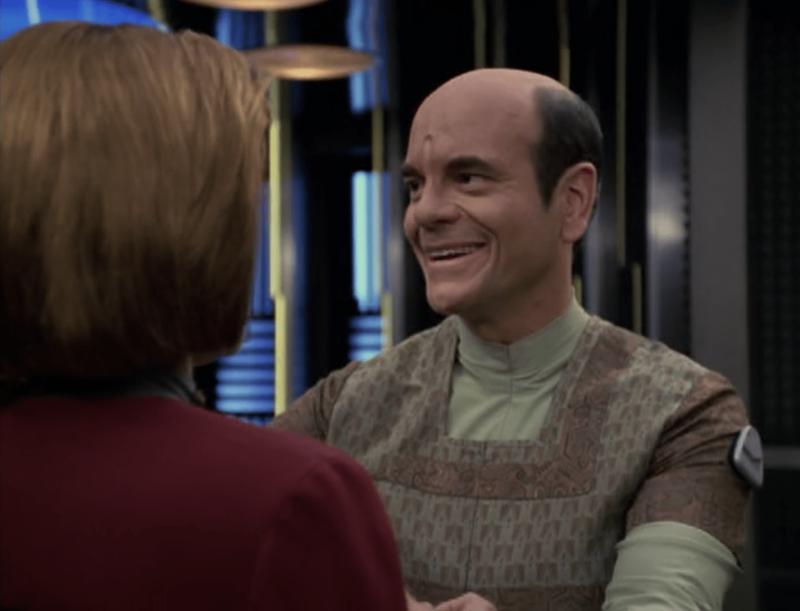 I barely remembered this season finale (and part two season 7 opener) from my first watch of Voyager, but it was a stand-out episode for me this time. Though I do feel like Seven relaxes some after this episode, I would have liked to have seen her relax even more. She really seemed to thrive in the world she and some other Borg had created for themselves. 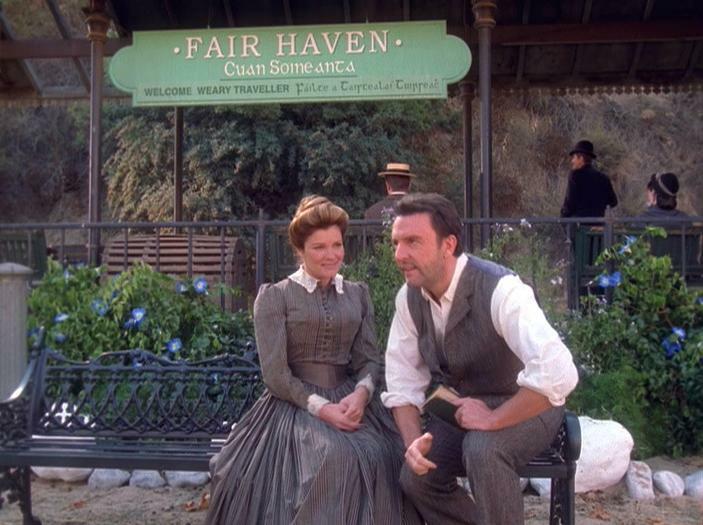 What are your favorite episodes of Voyager season six? We agree on three out of five of the top eps! 😀 I wonder why I didn’t note the season finale, I do remember that being very good. Maybe it will be a standout for me too whenever I get to rewatch the series. Have you watched more of Discovery? Also I was curious if you’ve seen The Orville? I love it when we have several episodes overlapping! We’ve watched the first three episodes of Discovery. Neither of us were crazy about the first two… we just didn’t care much about the characters and were ready to see the actual Discovery, but we both liked the third episode, though him more than me. The premise seemed to capture his attention while I’m more uncertain of it, but I did like the characterization better. We’re going to keep watching for now. How far have you gotten? What are your thoughts? We still haven’t seen The Orville but a couple of our friends said they liked it. What do you think of it? OK, so we ended up watching the first episode of The Orville tonight. We enjoyed it!